My mom has made Spritz Cookies every Christmas for as long as I can remember, so they are one of our family’s favorites. Mom usually makes red (pink) poinsettia flowers and green trees and wreaths—simple yet beautiful and delicious. Since my mom lives across the country form us, we won’t be seeing her this year for Christmas. We were very fortunate to spend the last two Christmases at her house, but this year we will be celebrating at home with just with our immediate family. We will enjoy these cookies and think of mom. Spritz cookies are made with a cookie press. I have owned two cookie presses--both of which left me very frustrated when I made spritz cookies. What should be a quick and easy method never ended up that way. I was very excited when Vicki from At Home with Vicki Bensinger emailed me to let me know that I won the Kuhn Rikon Cookie Press and Decorating Set that she was giving away on her blog as part of her Virtual Cookie Swap. I have to say that I love this cookie press! The cookies come out perfect with every click of the press—just like my mom’s! The kit also comes with decorating tools which I haven’t used yet, but look forward to trying out soon. And, the entire kit stores in the included plastic case so nothing gets lost or damaged! Thank you Vicki and Kuhn Rikon! And speaking of giveaways—the one year anniversary of my blog is in January, so I will be hosting my own giveaway soon! A Christmas tradition--tender, flavorful pressed cookies. 1. Preheat oven to 400°F.2. Cream the butter and sugar together in a large bowl.3. Stir in flour, salt, egg, almond extract (or vanilla), and food coloring (if desired). 4. Place dough into a cookie press and press out in desired shapes onto ungreased cookie sheet. 5. If desired, decorate cookies with colored sugar or sprinkles.6. Bake for 5 - 8 minutes or just until cookies are set, but not yet brown.7. Transfer cookies immediately from pan to a cooling rack. Jill your cookies are beautiful. I'm so glad you love the cookie press. Now I'm goin go use your recipe to duplicate these. They're so pretty and colorful. These are gorgeous, Jill. I don't have a cookie press but I see that I need to add it to my wish list. I love these! I have a cookie press on my list, so I hope to get one soon. For now I have been making the dough and then making a circle and pressing down with a glass. They are delicious cookies, but the do not even come close to the amazing cookies you show here, they look stunning! Have a great weekend! What a wonderful gift for christmas! These cookies surely look cute and colourful. My mom made Spritz cookies when I was a kid. They were always one of my favorites. Your cookies are lovely! 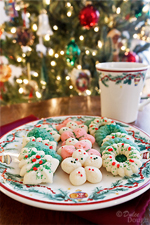 These cookies remind me of my mom too :) I love the picture with the tree in the background! I'm so excited that you won the cookie press - because it's obvious you'll use it! The cookies look delicious and your picture with the tree in the background is stunning! So beautiful! I need to dig out my cookie press!! Those cookies are so perfectly beautiful we'd hang them on our tree as decorations! Unfortunately one of us would eat them first! Wishing you and yours a very wonderful Christmas. Enjoy those cookies, we will! I love Spritz! Yours are so so pretty! So pretty! I love Christmas cookies. They taste great but the traditions and memories are so much better. These cookies look so pretty! I've never owned a cookie press, but this recipe seriously tempts me to get one. Jill, your festive spritz cookies are a delightful sight and I have confidence they are every bit as tasty as your mother's for you have memorable ties to hers. And despite the division of the country between you, the bond of these cookies brings you closer together. May you & yours have a joyous holiday season... best wishes for 2012 and with your upcoming blog anniversary! Oh my! These cookies are so gorgeous! I bet they tasted divine! Congratulations on winning the cookie press! These are so beautiful, Jill!! Now I really want one of those cookie press sets! Your Spritz cookies look magnificent, so decorative, and perfect! These cookies bring back a lot of fond memories for a lot of us! 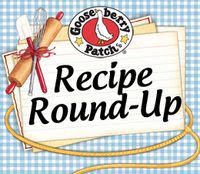 Thanks for sharing your treasured recipe, from your mom! miss spritz cookies! My Mom used to make them and they were always so good! Yours are beautiful :)! These cookies looks perfect and awesome for the gift. You have nice Christmas tradition Jill . Spritz cookies really make me miss my cookie press. Yours are very festive and pretty. Not sure why my cookie presser had issues with your recipe but mine did not turn out like yours and I followed everything to a tee. This is my first time using a cookie press. Am I using that wrong maybe? Any suggestions otherwise? ?